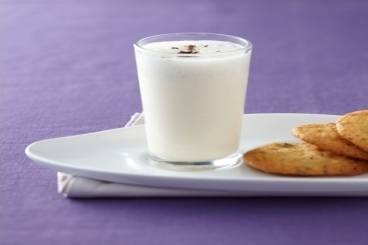 A creamy milkshake made with vanilla ice cream and tonka bean served with dark chocolate chip cookies. Soften the butter to room temperature. Split the vanilla pod in half and scrape out the seeds. Mix together the butter, sugar, salt, soft brown sugar, vanilla seeds and baking powder. Mix in the eggs and then sift in the flour. Finally, add the chocolate chips and then chill the dough in the fridge for 15-20 mins. Roll the dough into small balls and place on a baking tray covered with a silicone baking mat or baking parchment, leaving plenty of space between each cookie. Transfer to the oven and bake for 10-15 minutes. Remove the cookies from the oven and leave to cool. Mix together the vanilla ice cream and the cream and then slowly add the milk. Grate the tonka bean and add to the milkshake. Pour into glasses and serve with the chocolate chip cookies.